In the search for exoplanets, among all the “Hot Jupiters” and two-faced hellish domains, scientists hope more than anything to find Earth-like worlds, ones that may hold life. 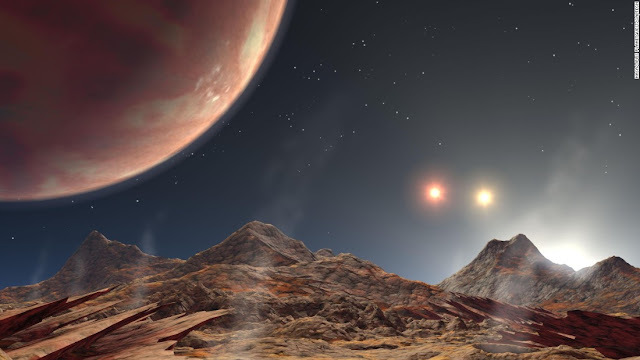 A truly breathtaking new Nature study has dramatically revealed that a second home may exist just over 4 light-years away, in the Alpha Centauri triple star system. 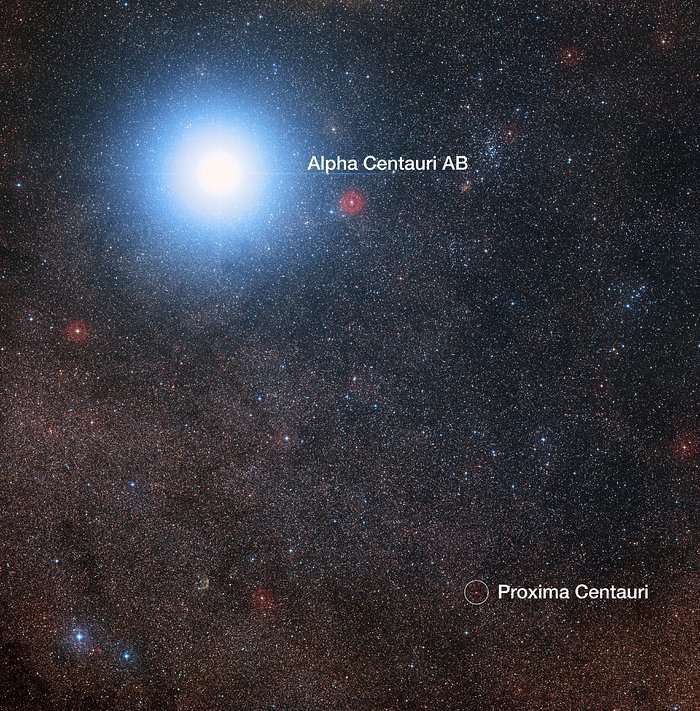 This new world dances around the red dwarf star Proxima Centauri, which is the closest star to our own Sun. Dubbed “Proxima b”, this exoplanet was discovered after painstaking years of analysis of the tiny movements of its host star in response to the gravitational pull of the planet itself. By picking apart these stellar wobbles, estimates of the planet’s mass and physical parameters could be made. It orbits the star every 11.2 days at an incredibly short distance of 7.5 million kilometers (4.7 million miles). It’s tidally locked, which means that one side of the planet always faces the star, and the other remains in perpetual darkness. The planet, which is equivalent to 1.3 Earth-masses, is likely to be around 5 billion years old, based on the age of the star system it's residing in. It’s possibly terrestrial, meaning that it has a rocky surface, and based on its temperature, it is possible for liquid water to exist at the surface. As we know from our own pale blue dot, where there is water, there is life. This means that Proxima b is likely to be the nearest possible home to life outside our own Solar System. After all this time looking into the far reaches of space, we may have a second Earth sitting right next door in our own cosmic backyard. Although it’s too early to definitively state that this world is “Earth-like”, as the presence of an atmosphere and water have yet to be shown, chances aren’t unreasonable for both being present. “Many exoplanets have been found and many more will be found, but searching for the closest potential Earth-analogue and succeeding has been the experience of a lifetime for all of us,” lead author Dr Guillem Anglada-Escudé, a senior researcher at Queen Mary University London, said in a statement. 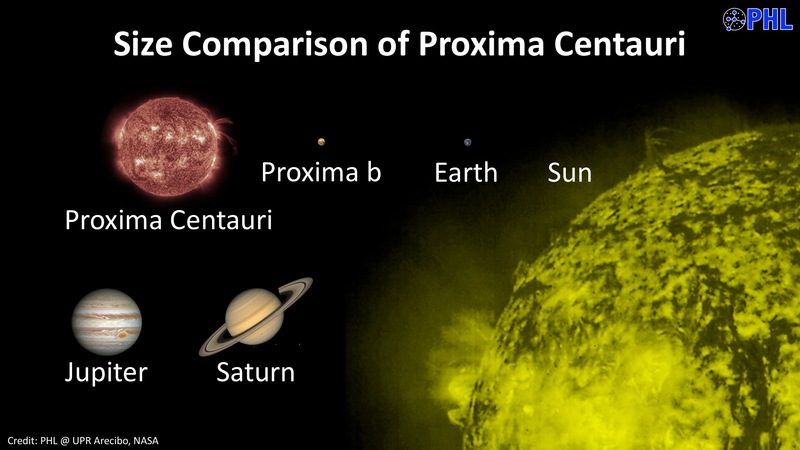 Proxima Centauri is a small red dwarf that is 88 percent less massive than our Sun, and 99.85 percent less luminous (true brightness). 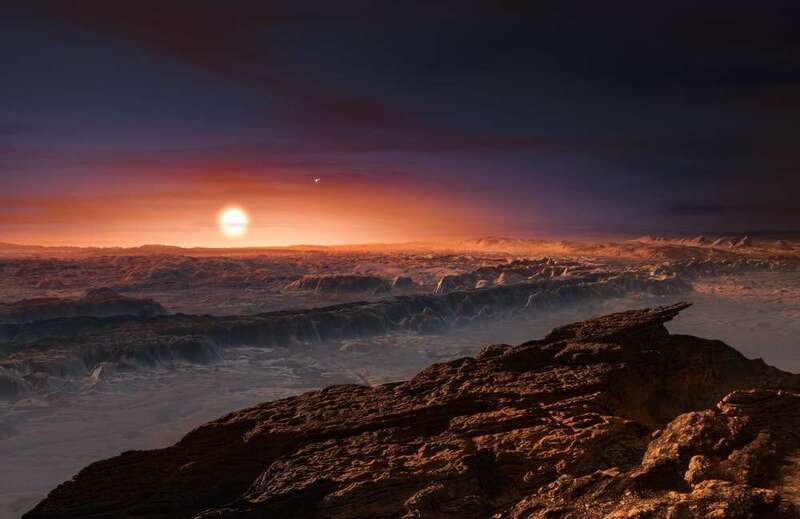 If Proxima b was at an Earth-Sun like distance from this red dwarf, it would be a cold, dead world – but the two are actually as close as 5 percent of the Earth-Sun distance. This means that it’s relatively warm, and the team has calculated that its equilibrium temperature – its surface temperature without any atmospheric greenhouse effect being taken into account – is -40°C (-40°F). Although this is easily below the freezing point for water, the team notes that Earth’s equilibrium temperature is somewhat similar, at about -20°C (-4°F). Importantly, Earth has an atmosphere, so the average global temperature is far above this, and liquid water exists on our planet’s surface. Does the same apply to Proxima b? Additional modeling shows that temperatures on Proxima b could be as high as 30°C (86°F) on its day-side and -30°C (-22°F) on its night-side if it does. The terrestrial world, however, also receives 100 times more high-energy radiation than Earth does today, particularly in the form of X-rays. This could perhaps blow away a thin atmosphere or prevent life at the surface from evolving. 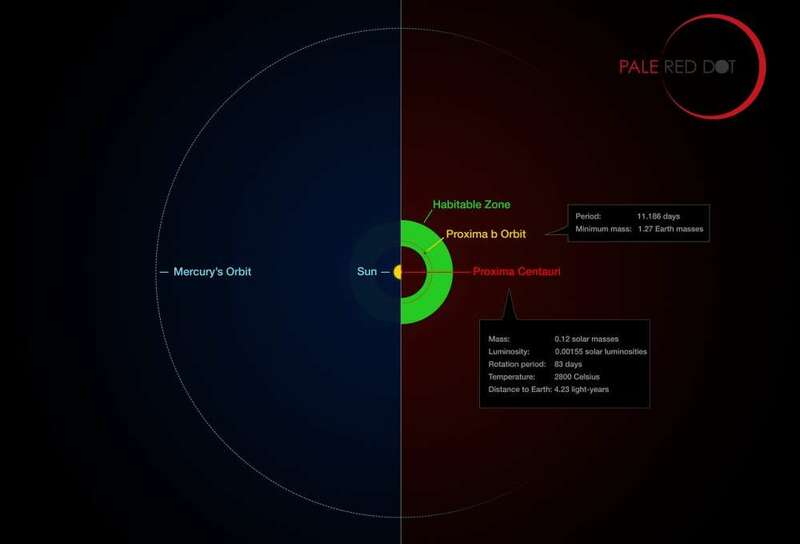 Although this has long been thought by many to be a restriction for life on planets orbiting red dwarfs, this may not necessarily be the case here. “What’s more interesting is the history of the planet,” co-author Ansgar Reiners, a professor of astrophysics at the Gottingen Institute for Astrophysics, told a press conference. If the planet was always this close to the star, and the star had an early violent stage wherein it fired out vast amounts of high-energy radiation, then perhaps an atmosphere would never have been able to form. Alternatively, if the planet was far away at this point, or if the star never had such an energetic past, then an atmosphere could certainly have formed – one that, despite the high-energy radiation, may still exist today. As for the possibility of liquid water, that is once again down to Proxima b’s mysterious past. “It depends on the initial conditions. Either this planet formed dry, or it formed far away and brought a lot of water with it from beyond the ice line,” Anglada-Escudé added. “Perhaps it started dry and comets rained every once in a while down on it and brought more water with it. Just recently, a project designed to send an interstellar spacecraft to the Alpha Centauri system was announced. Backed by Stephen Hawking, the initiative, named Breakthrough Starshot, will surely get a huge boost from the news that a strong contender for a second Earth is hiding away in that very same star system.